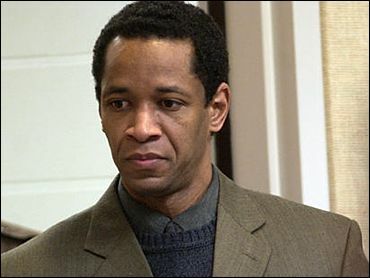 A Virginia judge on Tuesday set a tentative date of Oct. 4 for convicted sniper John Allen Muhammad's second trial, turning aside defense objections that it was too early to take such action. Muhammad is on death row after being convicted last year in one of the 10 killings in the shooting spree that terrorized residents in Maryland, Virginia and Washington, D.C., in October 2002. Mohammad, in prison greens and looking around the courtroom as he entered, made his first appearance in Fairfax County Circuit Court, where he is charged in another of the deaths, the Oct. 14, 2002, slaying of FBI analyst Linda Franklin. Circuit Judge Jonathan Thacher set the October trial date, although that may change. Muhammad's lawyers, Peter Greenspun and Jonathan Shapiro, argued that it was improper to move forward because Muhammad was not notified of the charges in a timely manner. Muhammad was indicted in Franklin's death in November 2002 but was not formally notified of the charges until last month. Thacher made no formal ruling on the notification claim and set a July 29 date to argue pretrial motions. Fairfax Commonwealth's Attorney Robert F. Horan Jr. said after the hearing that the state followed proper procedures in notifying Muhammad of the indictment. But Greenspun said he expects to subpoena U.S. Attorney General John Ashcroft and local prosecutors to explore the details of Muhammad's indictment in the Franklin killing. He did not elaborate. Muhammad arrived in Fairfax on Monday night from the Sussex I prison in Waverly. He sat without expression and did not speak during the 30-minute hearing. Muhammad was convicted last November in another Virginia county for the Oct. 9, 2002, murder of Dean Harold Meyers near Manassas. Defense lawyers are appealing the conviction. Muhammad's accomplice in the sniper killings, 19-year-old Lee Boyd Malvo, was convicted and sentenced to life in prison for Franklin's slaying. The two trials cost Virginia taxpayers about $3 million. Horan said it is worth it to try Muhammad a second time because of the seriousness of the crime and the potential for the death sentence to be overturned on appeal. "Virginia does it quicker than any other state in the union, and it still takes more than five years to get through that entire process," Horan told Hank Silverberg of CBS radio affiliate WTOP-AM. Prince William Commonwealth's Attorney Paul Ebert, who obtained the death penalty against Muhammad in the Meyers killing, would most likely be next in line to prosecute Malvo. He has said he wants to wait for the outcome of a U.S. Supreme Court case on the execution of juveniles before deciding whether to proceed. Malvo was 17 at the time of the 2002 spree.